Christmas is nearing! Today, I’m busy making sheet music ornaments as gifts for my piano students. I found this idea from this blogger, thanks to Pinterest. 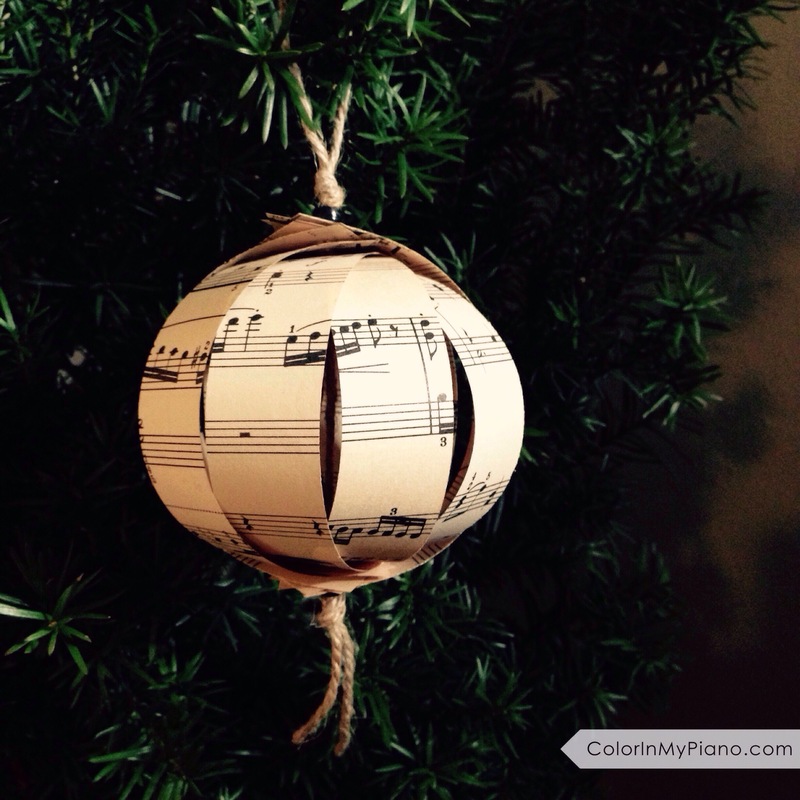 Here’s my own take on this sheet music ornament idea. For each ornament, I cut 12 pieces of sheet music into strips measuring 1 inch x 6.5 inches, and then punched holes at each end of the paper. I cut a length of 30 inches of jute twine, folded it in half, knotted it to creae a loop, and added beads and knots at various places along with the sheet music (as described in the video). The last step is to gently pull apart the paper around to form a circular shape. I love how it turned out! There are many ways to vary the ornament: perhaps cutting smaller strips of sheet music, cutting the paper with fancy-edged scissors, using a different type of bead, etc. My piano teacher friend, Susan West, and I have been busy practicing a selection of Christmas duets in order to perform them for a handful of local events during this December. Susan was kind enough to join me for today’s video to share a peek at the books we are using this year for our duet repertoire. Check out our favorite duet books and listen to our live performance of Norman Dello Joio’s O Come All Ye Faithful arrangement in the video below! Do you have Christmas duet recommendations for us to consider for next year? Please leave a comment below! Thanks for watching. All past broadcasts are here: ColorInMyPiano.com/live/. To watch future broadcasts live, download the free Periscope app (for iOS or Android), search for @joymorinpiano, and hop online on Mondays at noon Eastern time. Hope to see you next time!